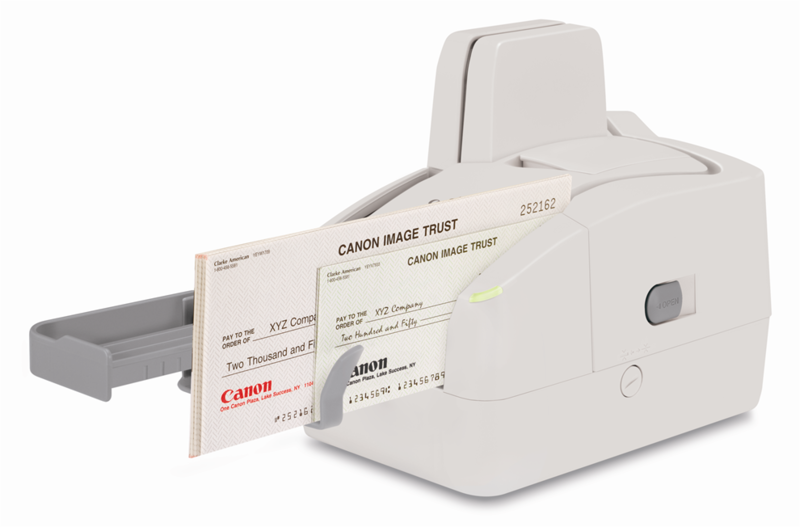 The Canon imageFORMULA CR-25 Check Scanner has been discontinued and replaced with the CR-50. Canon's imageFORMULA CR-25 model is capable of scanning batches of up to 50 checks, automatically routing MICR (Magnetic Ink Character Recognition) data, at speeds of up to 25 checks-per-minute (cpm) . As with the Canon CR-Series check transports, a pre-scan endorser further expedites the check routing and clearing process. The CR-25 Check Transport provides users with a choice of scanning modes including black-and-white, grayscale or color, at resolutions of up to 300 dpi. Canon's image processing technology, including advanced text enhancement and color dropout, emphasizes letters and signatures on illustrated or lightly colored check backgrounds for greater contrast and legibility. -Industry-leading performance-to-size ratio with rapid scanning speeds- of up to 25 cpm or 50 ipm*. -High-precision magnetic head for reading E13B or CMC7 MICR codelines and built-in OCR support. -Ultra-compact dimensions make it the ideal fit for teller counters and cashier windows. -Built-in, pre-scan imprinter for audit trail requirements. -Unique clam-shell design allows easy access for maintenance without exposing sensitive scanner components. -User-friendly, quiet operation enables teller sales and service productivity. -Output resolutions up to 300 dpi for optimum image reproduction. -Seven scanning modes including 24-bit Color, Advanced Text Enhancement, Adaptive Threshold, Black and White, and Grayscale for accurate and detailed check image capture to meet various application requirements. -Capture important check data from difficult-to-scan items with exclusive Adaptive Threshold Mode, which detects and removes excessive background effects such as security pentagrams or watermarks. -Infrared Double feed Detection and Paper thickness Adjustment for reliable handling of mixed-item batches, including personal/business checks, document carrier envelopes, and deposit slips. -Handles larger items up to 4.2 x 9.0 in size. -Plug-and-play connectivity with Hi-Speed USB interface. -CarePAK Extended Service Plan available.